Sunday, January 27th 3:00 pm -10:00 pm (there will be two shifts for those that cannot stay the entire time.) These times are only projections based on past performance and may vary significantly later in the race due to weather, trail conditions, and team strategy. We will keep you updated via email when we get more information. Highway 2 Checkpoint: Highway 2/Alger Grade road crossing, more details to come! *We will be meeting here, not the brewery. You will be assuring the safety of all Beargrease teams as they cross the road – this may include putting snow on the road to allow the sleds glide smoothly. Once the teams start coming, volunteers line either side of the trail – this helps keep the dogs on the trail and prevents them from going down the road instead. Some traffic control is required – you may need to stop sleds to allow cars to cross and wait for an opening between cars to allow teams to pass (typically cars want to stop and watch). We will have a bonfire going and some hot beverages to drink! 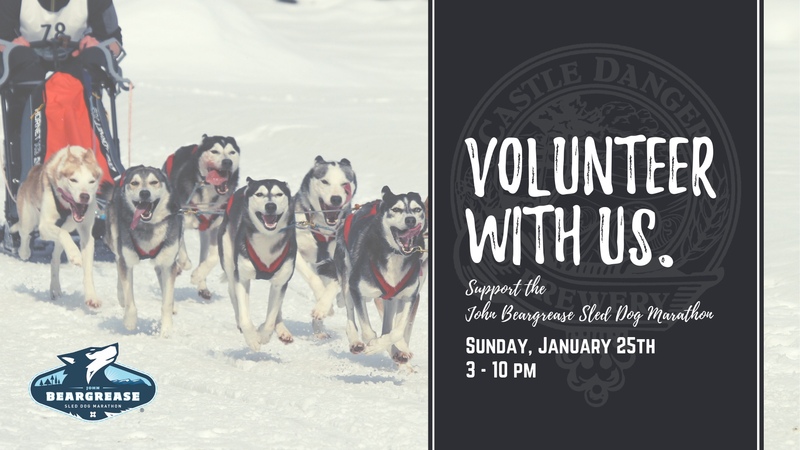 • Be ready to cheer on some sled dogs and mushers!! !